Material: PU. 1 x Wallet. Quality is the first with best service. 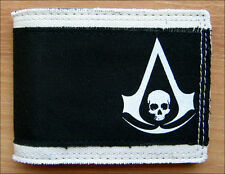 Assassins Creed IV Black Flag Black & White Bifold Wallet. Made of 60% Canvas, 20% PU and 20% Polyester. ID Window, bill fold, and multiple slots for cards. Weight is appx. 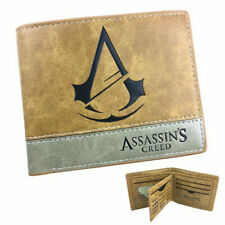 Assassins Creed Black Flag Leather Patch Wallet. Condition is Used. Shipped with USPS First Class Package. 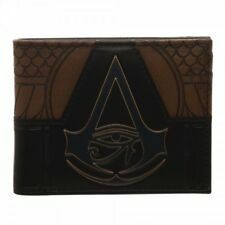 Assassins Creed Origins Bi-Fold Wallet. Very nice looking wallet! CONDITION - New. • Three Horizontal card pockets. Materials: PU, Nylon. WE WILL MAKE IT RIGHT! 1 x Wallet. Quality is the first with best service. 1 x Wallet. Quality is the first with best service. We will send the item after you order it. Ready to explore the wonders of ancient Egypt in Assassin's Creed: Origins?. This ACO Assassin's Creed Origin Bi-Fold Wallet is a must-have for keeping your cash out of greedy Templar hands. A black and gold-tone ACO logo on the front is accented by brown PU leather embossed with an Egyptian-style wing pattern. Assassins Creed Syndicate Character Bi-Fold Wallet & Bag - 2 Piece Gift Set Set Includes: 1 Wallet and Reusable Gift Bag Assassins Creed Syndicate Character Print Design Three Horizontal card pockets, Two Vertical card pockets, One Transparent ID window, One Full size currency compartment Tissue Paper Not Included with Gift Bag. Slim aluminum card wallet that is RFID Blocking. Carry your identification, credit cards & cash in one slim case that fits in your front pocket. Probably not, but we don't know. Small 3 - 5. Small 40" 30 - 32". Material :PU leather. You may also like. Style: Bifold. Size: 11 8.5 1.5 cm. Color: Brown. Size Guide. Large (UK Size 12). XL (UK Size 14). XXL (UK Size 16). Small (UK Size 8). X Large (18-24 months). Large (12-18 months). Small (3-6 months).